The New Testament describes the familiar account of the "woman at the well" (John 4:5-42), who was a Samaritan. Up to that point she had led a sinful life, one which resulted in a rebuke from Jesus Christ. However, she responded to Christ's stern admonition with genuine repentance, was forgiven her sinful ways, and became a convert to the Christian Faith - taking the name 'Photini' at Baptism, which literally means "the enlightened one". A significant figure in the Johannine community, the Samaritan Woman, like many other women, contributed to the spread of Christianity. She therefore occupies a place of honour among the apostles. In Greek sermons from the fourth to the fourteenth centuries she is called "apostle" and "evangelist." In these sermons the Samaritan Woman is often compared to the male disciples and apostles and found to surpass them. Later, Byzantine hagiographers developed the story of the Samaritan Woman, beginning where Saint John left off. At Pentecost Saint Photini received baptism, along with her five sisters, Anatole, Photo, Photis, Paraskeve, Kyriake, and her two sons, Photeinos and Joseph. She then began a missionary career, traveling far and wide, preaching the good news of the Messiah's coming, His death and resurrection. When Nero, the emperor of Rome, began to persecute Christians, Photini and her son Joseph were in Carthage, in Africa, where she was preaching the Christian gospel. After Jesus appeared to Photini in a dream, she sailed to Rome. Her son and many Christians from Africa accompanied her. Photini's arrival and activity aroused curiosity in the capital city. Everyone talked about her, "Who is this woman?" they asked. "She came here with a crowd of followers and she preaches Christ with great boldness." Soldiers were ordered to bring her to the emperor, but Photini anticipated them. Before they could arrest her, Photini, with her son Joseph and her Christian friends, went to Nero. When the emperor saw them, he asked why they had come. Photini answered, "We have come to teach you to believe in Christ." The half-mad ruler of the Roman Empire did not frighten her. She wanted to convert him! Nero asked the saints their names. Again Photini answered. By name she introduced herself, her five sisters and younger son. The emperor then demanded to know whether they had all agreed to die for the Nazarene. Photini spoke for them. "Yes, for the love of Him we rejoice and in His name we'll gladly die." Hearing their defiant words, Nero ordered their hands beaten with iron rods for three hours. At the end of each hour another persecutor took up the beating. The saints, however, felt no pain. Nothing happened to their hands. Photini joyfully quoted words of a psalm by David: "God is my help. No matter what anyone does to me, I shall not be afraid." Perplexed by the Christian's endurance and confidence, Nero ordered the men thrown into jail. Photini and her five sisters were brought to the golden reception hall in the imperial palace. There, the six women were seated on golden thrones, In front of them stood a large golden table covered with gold coins, jewels and dresses. Nero hoped to tempt the women by this display of wealth and luxury. Nero then ordered his daughter Domnina, with her slave girls, to go speak with the Christian women. Women, he thought, would succeed in persuading their Christian sisters to deny their God. Domnina greeted Photini graciously, mentioning the name of Christ. On hearing the princess' greeting, the saint thanked God. She then embraced and kissed Domnina. The women talked. But the outcome of the women's talk was not what Nero wished. 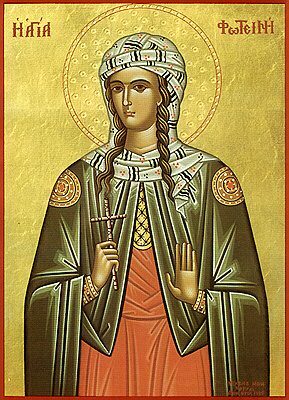 Photini catechized Domnina and her hundred slave girls and baptized them all. She gave the name Anthousa to Nero's daughter. After her baptism, Anthousa immediately ordered all the gold and jewels on the golden table distributed to the poor of Rome. from Christ the Saviour you drank the water of salvation. With open hand you give it to those who thirst. pray to Christ for the salvation of our souls.